Copyright & Revisions: Original copyright © 1985. Reformatted in 2013. No changes made to text. Publication History: Originally published in Proceedings of the 1984 Conference on Outdoor Recreation: A Landmark Conference in the Outdoor Recreation Field. John C. Miles and Ron Watters (Eds. ), Idaho State University Press, Pocatello, 1985. pp. 157-160. Editor's Note: This paper was published in 1984 and the prices quoted below have obviously increased over the years. Kirk Bachman who is mentioned below still make backcountry yurts. You can reach him through Sawtooth Mountain Guides. 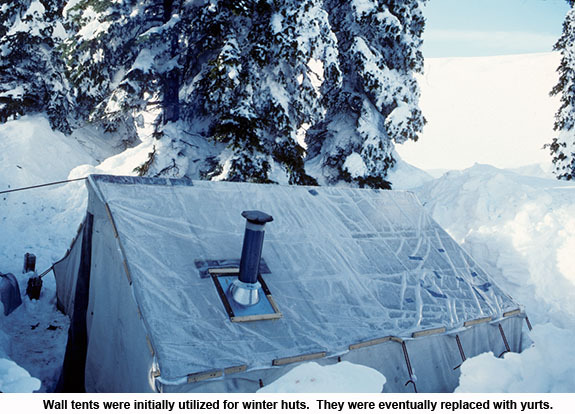 With some ingenuity and the use of volunteer help, outdoor recreation programs can develop winter hut systems. 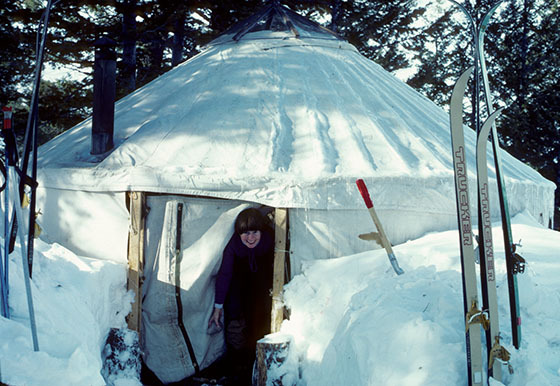 This paper traces the development of a four-yurt system outside the community of Pocatello. The utilization of winter huts for recreational and educational purposes is increasing in the United States and Canada. Hut systems presently operating have been developed either by commercial outfitters or organizations such as the Sierra Club. Some of the original hut systems include log or wood-framed structures resembling the well-known European and Scandinavian huts. Though wood cabins are beyond the means of most, the use of portable canvas tents or yurts--described later in this paper--makes it possible for university, city, and other types of recreational programs to develop hut systems in their own area. The initiation and implementation of the hut system developed by the Idaho State University outdoor Program will be used as an example. The hut program was launched in the fall of 1983. Through public appeals for help, the ISU outdoor Program acquired two used canvas wall tents and a Coleman stove and lantern as gifts from interested individuals in the community. Both the City of Pocatello Recreation Department and the local nordic ski club became interested and joined the Outdoor Program as sponsors. The City of Pocatello agreed to set up one of the huts and the ISU Outdoor Program was responsible for the two other huts. This cooperation and assistance from other community resources was key in the success of the Pocatello hut system. Three sites for the huts were located on Caribou National Forest and near the town of Pocatello. An attempt was made to pick sites which would be accessible by varying ability levels. The beginning level hut was located 3 1/2 miles from the trailhead near a gradually rising snowbound road. The intermediate hut was 3 miles from the trailhead, but involved a 2300 foot elevation rise. The advanced hut was 4 miles from the trailhead with a 2400 foot elevation rise. While Pocatello is ideally situated near mountains and national forest land, it is entirely possible to set up one or more huts in less ideal locations. Canvas tents or yurts can be erected in the fall and taken down in the spring. This portability opens up a great range of possible sites. State parks or forests or even a farmer's woodlot in a midwest location are all possible sites. Because use of the huts is during the winter season, there is little or no impact to the environment. Most agency personnel and private land owners, who are fully informed of the nature of the huts, have no objections. However, plenty of time should be allowed to gain the proper clearance and permits to go ahead with the system. Six months in advance is not too early to apply for special use permits with some government agencies. Each of the three huts in the Pocatello start-up system were located so that a skier or snowshoer could travel from hut to hut. The distance between huts varied from 5 to 8 miles. After the first year of the system, it was found that the great majority of users traveled to one hut and returned. Presently, the hut to hut trip is rare, but it is likely to increase as more individuals become familiar and comfortable with the system. Approximately two weeks were spent constructing internal wooden frames for the canvas tents. The wood frames were constructed out of 2 x 4's and 2 x 2's to provide support from snow loading against the roofs and walls. Additional rough cut lumber was purchased for flooring. Sheet metal wood stoves were acquired for $40 each from a ranch supply store to provide a heat source in the tents. The stoves were found to be more than adequate for heating purposes, keeping the huts warm and toasty in very cold outside temperatures. The total cost came to approximately $500 per hut not including the donated items mentioned earlier. In October and November, the tent, flooring, and other supplies were carried into the hut sites. At each of the three sites, two cords of wood were cut and split and the tents erected. To get the project underway, initial efforts demanded a great amount of volunteer and Outdoor Program staff time. The total amount of work came to over 500 man-hours of paid and volunteer labor. In the second year of the program, however, the amount of volunteer and staff time was reduced considerably. Short guide to each hut, access points and difficulty. Once an individual made a reservation, part two of the hut manual was given to him/her, which included detailed route descriptions and photocopies of the necessary topographic maps. Starting in the 1985-86 season, an additional education tool will be initiated. A video tape is under preparation which will visually portray most of the information covered in the hut manual. The video should be around twelve minutes in length which is a convenient period of time for most users to view the tape. All hut users will be asked to sit down and watch the video before undertaking the tour. The showing of the video should be highly effective in presenting key information about the huts. In addition, the tape also serves an important function in alerting potential users to the risks of hut use, which is vital in a proper program minimizing liability. The Pocatello system was set up to give priority to organized events of the sponsoring organizations as well as trips by volunteers. After reservations were made for organized events and volunteers, the system was open to the general public. Members of the public could make reservations through the City of Pocatello Parks and Recreation Office. The cost of the huts was $10.00 a night. Hut fees, however, will be raised significantly in the future to recover some of the initial expenses as well as provide replacement costs. 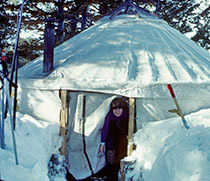 In the second year of the program, the canvas tents were replaced by yurts. Yurts are dome-shaped canvas structures which have an internal frame supported by a steel cable. All the strength of the structure is placed on the cable which enables it to support large accumulations of snow without collapse. The dome shape of the of the yurt makes it roomy--the 16 foot size, the most ideal size for backcountry use, will comfortably hold seven people for an overnight stay. 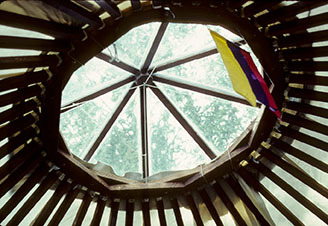 Yurts are also aesthetically pleasing with a plastic skylight capping the peak of the structure making them light and accenting the feeling of roominess. one additional advantage of yurts is that they are easy to set up and take down. The yurts used in the Pocatello system were designed by Kirk Bachman. Bachman, originally a staff member of the ISU Outdoor Program, now owns a backcountry guiding and outfitting business in the Teton area. He has designed a special backcountry adaptation of the yurt which he has fine tuned and tested for the last six years. He lived in a yurt for an entire winter in Stanley, Idaho, famous for its -45 degrees Fahrenheit temperatures. The approximate price of Bachman’s yurt is $2,000. For more information, write: Outback Yurts, P. 0. Box 69 Driggs, Idaho 83422. The response from the public and participants using the huts has been overwhelming. By the second year, huts were so popular that some huts were reserved solid from Christmas to March. One of the spin-offs of the hut system is that it has become an excellent form of public relations for the sponsoring organizations. Members of the public have been very receptive and complimentary of the system. Families can use the easier huts and backcountry devotees rave about the more difficult huts. The hut system is also attractive to the media. Several newspaper and television stories have resulted from the Pocatello system. Hut systems, whether they consist of one hut in a farmer's woodlot or a series of huts in the mountains, can greatly enhance a recreational program's winter activities. A hut provides an excellent base from which to practice winter camping and survival techniques. With a warm hut nearby, participants can build igloos, snow caves, and snow trenches with little safety risk. If someone becomes too wet and the temperature drops, the hut is available nearby as a backup. Finally, huts provide an important first step for those individuals interested in learning how to winter camp. By using a hut, one can make a few mistakes and still have an enjoyable trip. After a person has learned about proper clothing and has developed some competent travel techniques with a pack full of winter gear, he'll be far more prepared for actual winter camping than had he not had the hut experience.